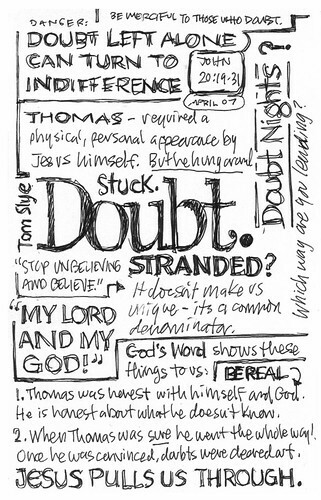 A few weeks ago, Tom Slye, the youth director at my church gave an excellent message on doubt. He talked about what doubt is, and offered ways to think about and deal with doubt in a realistic ways. I often take notes during messages, as it helps my mind process the words. Lately I've been toying with the idea of capturing notes in a graphical way — using typography for emphasis — to force myself to focus on the core of the talk within a limited space. On the right is my one-page sketchtoon from Tom's talk on doubt, which I think turned out pretty well. There are a few things I want to try on future talks, like mental imagery and drawings embedded in the text, even color if I can pick up a small set of markers or pencils that are easy to carry along with my Moleskine sketchbook. In general, I find sketching out notes offers a different, more focused way of engaging of my whole brain, rather than just left brain. Just yesterday I was inspired to explore this idea of sketching notes, when I came across Dave Gray's wonderful LIFT Conference sketches. His stylized sketch notes are another cool way to capture notes from a talk in a more visual way. Here's a great talk by Dave Gray and Dana smith on Visual Thinking, with some exercises you can follow along with. Be sure to check out Dave's Visual Thinking School on Squidoo. All good stuff, check it out! I like that idea, Mike. It's timely too. I'm spending the next couple of days attending an H.R. conference. I tend to mind map these things, but I'll give your ideas a try in a couple of sessions and see how it works out. I'd be interested in hearing about your experiences Ian. For technical notes maybe this approach would me too limiting, but maybe not for those where there is an overarching theme and nuggets of details. I like your scanned example, Mike! I often find that the talks where I'm doodling will usually stick in my mind better, usually because I'm working on a single image that helps to trigger a memory later on. I like your use of "typography" and will have to try that myself sometime. I tried it at UE Intensive yesterday and it worked pretty well. I'm scanning images from my Moleskine sketchbook now, and will post them here, and on Flickr, on Friday. great post mike. I find this kind of 'word doodling' really helps me get ideas into perspective. But over the intervening 25 years I've got out of the habit. I finally gave in on Wednesday and bought a large and a pocket size moleskine so I'm determined to try my hand again. Cheers. Be sure to check out Visual Thinking School at Squidoo for some fun experiments � and don't let your skill level (whatever is is) stop you from trying. This is *not* about creating art to be hung, it's about doing art for yourself and for expression John. Can't wait to hear how you like sketching! I was looking at your squidoo lens earlier today and found the Visual Thinking course via that.